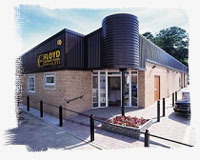 Floyd Automatic Tooling Ltd based in Baldock in Hertfordshire, was established in 1990 as a specialist tooling company servicing the new generation of CNC SLIDING HEAD MACHINES. In addition to tooling these machines, Floyd also stock tooling and offer solutions for MULTISPINDLE AUTOS, ROTARY TRANSFER MACHINES, HIGH SPEED MACHINING, and MACHINING CENTRES. Floyd have been associated with the BTMA since the company was formed and provides technical support to both Full and Technical members. The company has extensive stocks supported by a portfolio of prestigious suppliers from across Europe, such as: Alesa, Kaiser, Schaublin, Neukomm, Applitec, Habegger, Ifanger, Hommel & Keller, Valtec, Schwanog, Manigley, and many others.